India has decided to cut its planned nuclear power plant construction by two-thirds. This will further expand the country’s use of coal for electrical power generation, writes Dan Yurman, nuclear energy specialist and author of the Neutron Bytes blog. 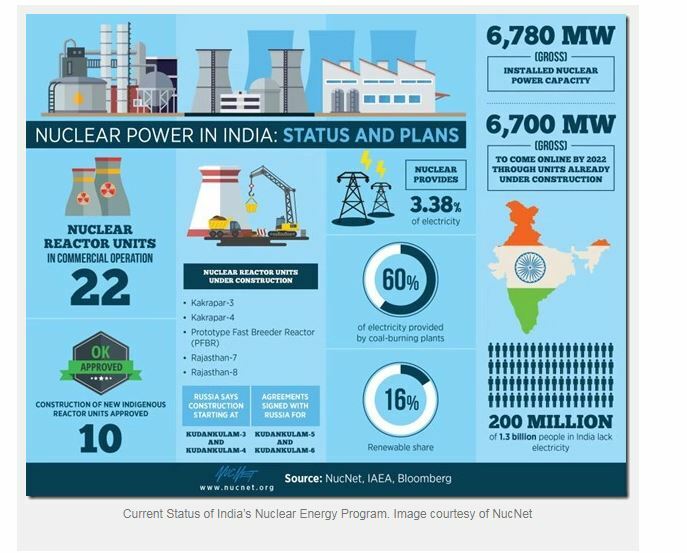 The Financial Express, one of India’s major newspapers, reports that the Narendra Modi government, which had set an ambitious 63,000 MW nuclear power capacity addition target by the year 2031-32, has cut it to 22,480 MW, or by roughly two-thirds. The decision has enormous implications for expanding use of coal for electrical power generation and for release of CO2, other greenhouse gases, and for adding to India’s dire air pollution problems in its major cities. The drastic reduction in planned construction of new reactors will diminish India’s plans to rely on nuclear energy from 25% of electrical generation to about 8-10%. The balance of new power requirements will likely be met by use of India’s enormous coal deposits. It appears that India’s long list of nuclear reactors, which at one time it aspired to build, is now in the dustbin. Instead, a much shorter list of 19 units composed of indigenous 700 MW PHWRs and Russian VVERs will be completed for an additional 17 GWE. He added. “progressive completion of the projects under construction, the installed nuclear power capacity will reach 13,480 MW by the year 2024”, which will be a little less than 14,340 MW target. The list of 57 cancelled reactors also includes 700 MW PHWRs and Russian VVERs. 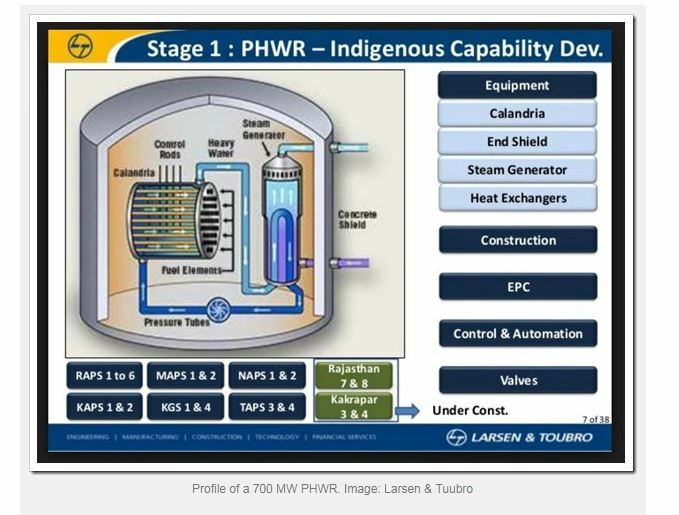 In addition, it includes future plans for Areva EPRs and Westinghouse AP1000s. Four fast breeder reactors are part of this list which raises questions about India’s policy commitment to its three phase plan for nuclear energy. That ambitious plan begins with a fleet of the 700 MW PHWRs using natural uranium. The second phase places its bet on plutonium fueled fast breeder reactors. The third phase involves U233 / thorium reactors. India has large deposits of thorium, but has not built and operated a commercial thorium fueled reactor for power generation. A fast breeder reactor using U233 / thorium is being developed at Kalpakkam. The plant will use plutonium produced in PHWR reactors as well as from PWR reactors to breed U-233 from thorium. While the Department of Atomic Energy did not specify the reasons for the change, it is likely that India has come face-to-face with the same reality that other developing nations seeking rapid construction of nuclear power plants. The challenges are the lack of funding, a reliable supply chain that can handle a huge increase in orders, and a trained workforce to build and operate the plants at the planned level of activity. Based on the World Nuclear Association profile of India’s nuclear program, this is the list (table below) of reactors that will likely be completed by the mid-to-late 2020s. The list covers only two of the six Areva EPRs slated for Jaitapur on India’s west coast and only two of the six Westinghouse AP1000s planned for Andhra Pradesh on its east coast. However, Rosatom will complete four more 1000MW units at Kudankulam in Tamil Nadu on India’s southern tip. As a developing nation, India needs to provide electricity to huge sections of the country which don’t have reliable power. About 200 million of the country’s 1.3 billion population have none. According to the New York Times in July 2012 India suffered the largest electrical blackout in history, affecting an area encompassing about 670 million people, or roughly 10 percent of the world’s population. It lasted three days. Nothing that requires electricity worked during that time. Trains did not run, lights were off, telecommunications were out. It was a total absence of power. The country accounts for eight percent of world’s total coal consumption. About two-thirds of India’s electricity generation comes from coal. With a major cut in planned new construction of nuclear reactors, the country will rely more heavily on building coal fired power plants. India holds the fifth biggest coal reserves in the world. The country’s proved coal reserves are estimated at 61 billion tonnes. India accounts for about seven percent of the world’s total proved coal reserves. India is the third biggest coal producer, after China and the US. India produces about six percent of the world’s total as officially reported but this number is undoubtedly higher. India’s coal mines are owned by the government but operated by private firms. It also imports coal and is the world’s third biggest coal importer (200M tonnes in 2017) after China and Japan. According to the Ministry of Coal, coking coal is being imported by Steel Authority of India Limited (SAIL) and other steel manufacturing units mainly to bridge the gap between the requirement and indigenous availability and to improve the quality. Coal based power plants, cement plants, captive power plants, iron foundries, industrial consumers and coal traders are importing non-coking coal. Coke is imported mainly by pig-iron manufacturers and iron and steel sector consumers using small blast furnaces. According to September 2017 report in the Hindustan Times, despite the Narendra Modi government’s claims of being committed to the Paris Climate Agreement, India registered one of the largest increases in greenhouse gas (GHG) emissions in 2016, in contrast to the other major emitters, which either saw decreases or stable emissions. India’s greenhouse gas emissions rose by an alarming 4.7% in 2016, compared to the previous year, the report released by Netherlands Environmental Assessment Agency said. Coal consumption rose by 4% in 2016. With the cancellation of two-thirds of India’s planned nuclear reactors, this trend is likely to increase creating a significant global climate issue. In early March French President Emmanuel Macron made a trip to India not unlike that of his predecessors over the past decade to plead the case for building six 1650 MW Areva EPR nuclear reactors at Jaitapur on India’s west coast. For its part, India repeated its pledge to begin work by the end of the current year, a pledge it has made, but not kept, with previous French Presidents. The key sticking point has been and continues to be India’s supplier liability law which makes it impossible for western reactor suppliers to enter India’s nuclear energy market. India has signed the IAEA Convention for Nuclear Damage, but the domestic law remains on the books. The current status of the project is that ground has not been broken. While technical negotiations are complete, NPCIL remains in discussions with EDF, which will manage the construction, over costs. Also, use of Indian vendors for long lead time components like turbines will be part of any final deal. A final price has not been set for the project which was originally proposed to India in 2008. Dan Yurman is a nuclear expert and the publisher of the blog NeutronBytes. This article was first published on Dan Yurman’s blog Neutron Bytes and is republished here with permission. The implicit assumption of the article: it is either nuclear or coal. A bit outdated by now. If I look at the curve of newly commisioned indian coal power plants, this rapidly runs toards zero, after a peak some years ago. Also the full load hours of the indian coal power stations are shrinking, even without large nuclear power plant program. So the simplistic model for powr generation in india, only consisting of coal and nuclear power seem to miss important developments….. So I’d suggest they have run Thorium capable reactors, just not run the fuel yet. Or am I missing something about their CANDU knockoff? Near as I can tell, the AHWR is just a PHWR that’s more optimized for breeding U233. Not some dramatic leap forward. 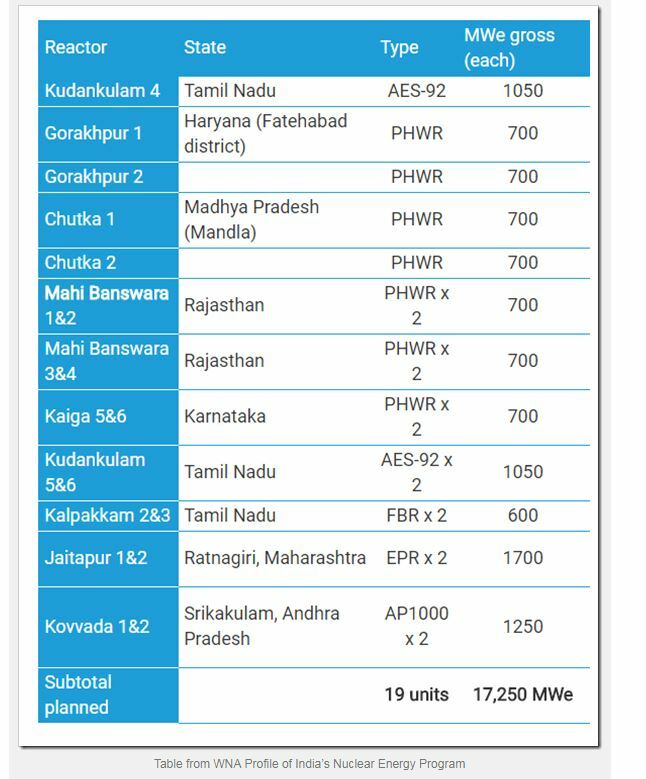 THe 700 MWe Indian PHWRs have evolved from their 220 MWe CANDU “knockoffs” as you put it, but I wouldn’t underestimate the further step to AHWR. There is a little on those in the WNA link in Dan’s article. It is 2018 and the author manages to write a whole article about electricity in India without mentioning renewables once. Just fear-mongering about a blackout six years ago and coal although the buildout of coal plants has dwindled enormously already by renewables, and plans for coal plans keep getting canceled as well just like the plans for nuclear. The people in India without electricity will get it by decentralised renewables as this is already happening right now. How hard do you have to close your eyes to not see what is already going on? India had 58 GWe of renewables including small hydro last year. But plans do not seem to include major additions to this as there has been some pushback due to unreliability (intermittency) and they don’t seem to have the same sort of subsidies from consumers and distributors as in the west. I find “Installed renewable power capacity is currently about 60 gigawats (GW), and India plans to complete the bidding process by the end of 2019/20 to add a further 115 GW of installed renewable energy capacity by 2022.” Maybe tripeling the installed equipment in 4 years is not a “major addition”. India has form with grandiose plans, not least re nuclear, where 63 GWe by 2032 has shrunk to about 23 GWe in seven years. Certainly they added 11 GWe of solar and wind capacity in 2016-17 and MNRE is talking about having 175 GWe by 2022 – we shall see!